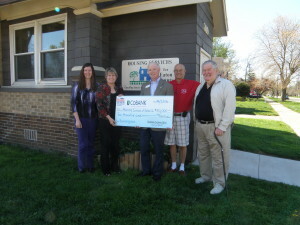 A $10,000 gift to Housing Services of Mid-Michigan (formerly Housing Services of Eaton County) was presented today (May 3, 2016) by HomeWorks Tri-County Electric Cooperative of Portland, represented by general manager Mark Kappler. The gift was made possible by a $5,000 matching grant from one of the cooperative’s lenders, CoBank, as part of CoBank’s Sharing Success program. This $3 million charitable fund was designed to benefit cooperatives and the charitable groups they support throughout rural America. CoBank first launched the program in 2012 in conjunction with the International Year of Cooperatives. 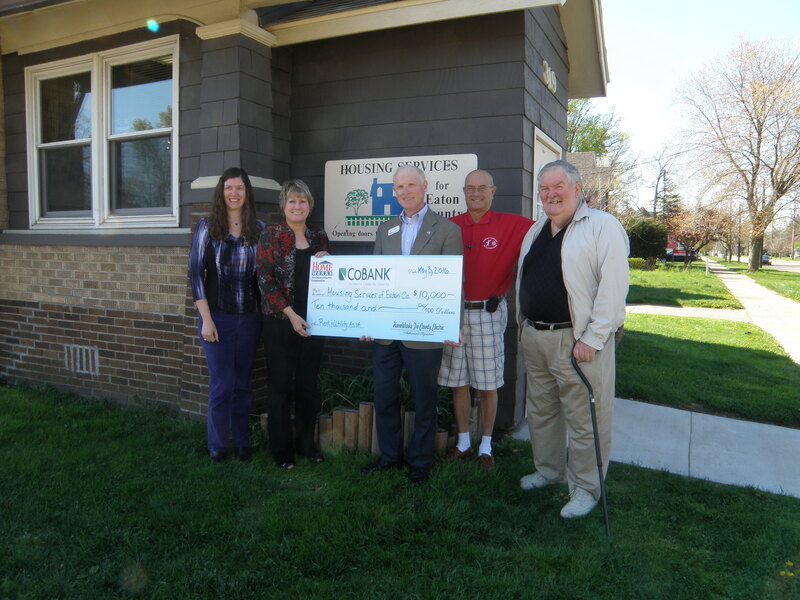 “We were pleased to work with CoBank to support an organization like Housing Services. Even people in our small, rural communities sometimes need help with safe, affordable housing. This gift will help provide funds and other support to make that possible,” said Kappler. Community service is an essential part of HomeWorks Tri-County Electric’s mission to provide its members and customers with energy, comfort, and communications solutions that will enhance their quality of life. Created in 1937 by farmers in Eaton, Ingham, and Jackson counties, the co-op moved its headquarters to Portland in 1941; it now serves nearly 26,000 homes and businesses in 13 mid-Michigan counties. Since 1993, co-op members have given over $2 million to help needy families and organizations across the area through the Tri-County Electric People Fund and Operation Round Up, in which they voluntarily round up their monthly electric bills. Housing Services of Mid-Michigan assists low-income individuals and families with housing payments to prevent homelessness. They also work to help households attain self-sufficiency by providing intensive case management and support services. Funds are used to make direct payments to landlords, mortgage holders, and the county treasurer to prevent evictions, foreclosures, and tax foreclosures. Housing Services also helps relocate people from sub-standard, overcrowded, or unaffordable housing, which will promote stability. CoBank provides loans, leases, export financing and other financial services to agribusinesses and rural power, water and communications providers in all 50 states. It’s also a member of the Farm Credit System, a nationwide network of banks and retail lending associations chartered to support the borrowing needs of U.S. agriculture and the nation’s rural economy. CoBank is headquartered outside Denver, Colorado. Photo caption: Mark Kappler, center, presents the grant check to Housing Services, represented by, from left, assistant director Christie Harry, director Denise Dunn, treasurer Jim Dexter, and trustee Dar Benjamin.